In this part of our Guide, we continue our essay writing guide with actionable steps for writing an essay response for any question you might be asked (from scratch without breaking a sweat)! 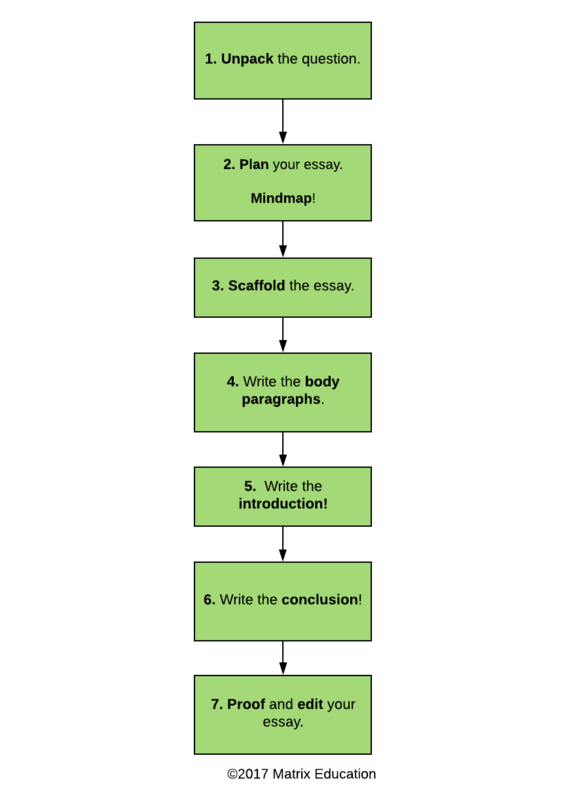 In the last part of our Guide, we looked at how essays work and discussed the structure and planning of an essay. If you haven’t read it, you should go check that out first. In this part, we’ll get into the nitty-gritty of writing the essay and give you some tips for producing Band 6 responses in exam conditions. But first, we need to discuss what essays are and how they should work. Now that we’ve refreshed our memory, let’s pick up where we left off with the last post. Let’s put together our body paragraphs. Now you are ready to start writing. You have your ideas, your thesis, and your examples. So, let’s start putting it together. The topic sentence – You use this to introduce the subject matter of the essay and locate it in the logic of your argument. 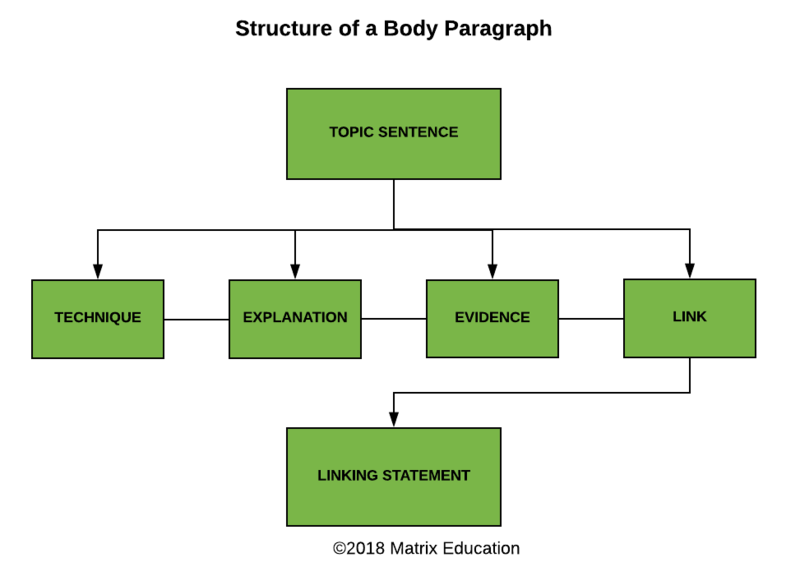 Evidence and argument presented in a T.E.E.L structure – This is the substance of your argument. The linking statement – This connects your body paragraph to the rest of your essay at the same time as summing it up. How do I write a Topic Sentence? The topic sentence introduces your body paragraph. It must introduce the theme or idea for the paragraph and connect it to the broader argument in the essay. Thus, it is very important that you get it right. This can be daunting, but it shouldn’t be. Check your plan and decide what the focus of the paragraph will be. Reread the question and your thesis in response to it. Ask yourself how you can combine these two parts – the focus of the paragraph and your thesis. Decide on how you can best convey this to a reader in one or two sentences. Now you’ve got your topic sentence, you need to validate it by supporting it with evidence. So, where should you start with this? In order to demonstrate how to write a body paragraph, let’s consider a student who is writing an essay on Arthur Miller’s The Crucible for Common Module: Texts and Human Experiences. We’ll look at their notes and then a paragraph they’ve produced, before walking you through how to use evidence. Let’s go! Stage Direction Abigail responds to the accusation that she has had an affair with Proctor by refusing to answer Danforth’s question: is this accusation true? Her imperative Tone is important because she is challenging the power of Danforth, the most important and powerful man in Salem. The stage direction indicates that she has power of Danforth. Not only has she protected her self-interest, she has manipulated Danforth. Miller contrasts the collapse of the community in Salem with the HUAC trials. He focuses on the inversion of power occurring in the court. It is ironic that Abigail, a young girl, has the power to manipulate the Deputy Governor of the Province. Witness collusion with McCarthy led the HUAC trials. She is an example of an individual that had a profound effect on her town and the fledgling United States. She is a pivotal figure in a narrative that shapes how we view partisan politics and pogroms. Epithet Proctor is heartbroken and angry that Elizabeth has been arrested and has lied to protect him. Elizabeth’s lie is tragically ironic: he was relying on her to maintain her integrity to save them all. Proctor Blames Abigail for Elizabeth’s arrest and potential execution and those of the other townsfolk. Miller depicts the corruption of HUAC. Proctor is representative of individuals who fought stood against the trials. It is ironic that Proctor, a predominantly moral man, is bought down by a lie and his adultery. The personal has been unduly politicised similar to how witnesses were convicted for being gay, not merely communist. Proctor has since become a symbol of heroism and political martyrdom. In The Crucible, Miller represents how Senator McCarthy’s HUAC trials turned citizens against one another. Miller uses the Salem Witch Trials as an historical allegory. In Salem, the young girls who were the cause of the accusations of witchcraft quickly turned on the other townsfolk, inverting the power structure of the town. Similarly, in the HUAC trials witnesses colluding with McCarthy often led the trials and dictated who would be tried and what the charges are. Miller represent this absurd power dynamic with Abigail’s imperative assertion that “If I must answer that, I will leave and I will not come back!” The stage direction “[DANFORTH seems unsteady,]” reveals the power Abigail has over the leading authority in New England. In contrast, Proctor – a moral man – is incriminated by his wife’s desire to protect him by lying. Proctor’s exclamatory metaphor accusing the judges of “pulling Heaven down and raising up a whore!” depicts his righteous anger at the personal being politicised. In The Crucible, Miller is capturing the injustice of an historical event – the HUAC trials where liars and criminals were able to accuse and destroy innocent individuals for being gay, a political and social witch-hunt that became known as the Lavender Scare – if it couldn’t be proven they were communists. This is a detailed paragraph, so how has the student gone from their notes to a complex response? Let’s see the steps that Matrix English Students are taught to follow when using evidence in a T.E.E.L structure. How do I use evidence more effectively? Make sure your example is relevant to the question and thesis. Don’t list examples. Anybody can memorise a selection of examples and list them. You must produce an argument. Discuss the technique used in the example and the effect this has on meaning. 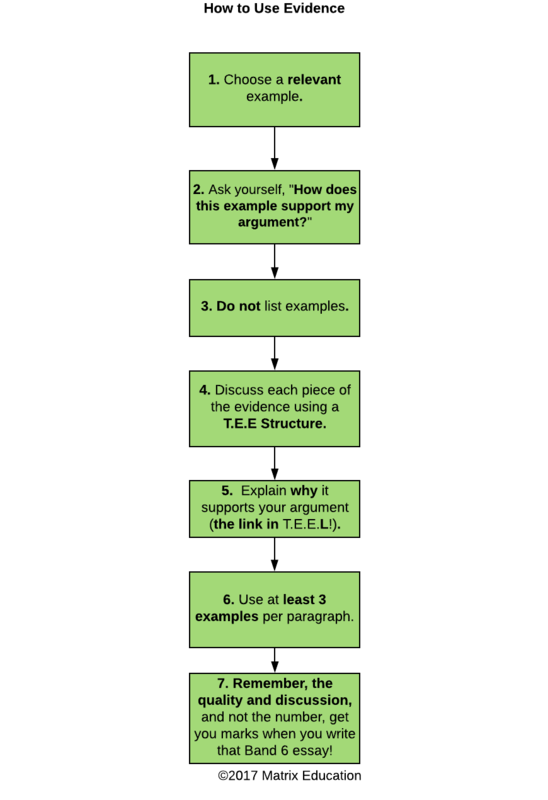 Explain why the example supports your argument – this links it back to your topic sentence and thesis (the L part of a T.E.E.L Structure). Ensure that you use at least three examples per paragraph – this means using T.E.E.L three times at least per paragraph. Remember that it is the quality of the example and your discussion of it that will get you marks. Summarise your body paragraph in a linking statement – take your core idea and restate it. You may consider incorporating a connection to the module or reasserting your topic sentence. Now, you’ve got your head around using evidence for the body paragraph, we should quickly discuss addressing the Module and using your supplementary material. How do I address the module? Incorporate the Module concerns into your topic and linking sentences – Don’t merely make the topic sentences about a theme or the text. Connect them to the module by incorporating the language of the Module Rubric. Connect your examples to the Module concerns – for example, in a Module A essay when discussing evidence, explain how it conveys context or demonstrates the importance of storytelling. Discuss the module with your evidence – You must connect your examples to the module concerns. For example, if you are studying a text for Module B then you must explain how your examples demonstrate the presence (or absence) of Textual Integrity, lasting value, or universal human appeal. How do I discuss supplementary material? Don’t let critics overshadow your perspective – Don’t begin a paragraph with somebody else’s perspective. Begin with your interpretation of the text and then compare theirs with your own. Don’t use overly long quotations – You want to use short and direct quotations from others so as to not drown out your own voice. Explain the relevance of the critic – Don’t just quote critics, explain in detail why you disagree or agree with them. Whenever possible, use an example to support your position. This will ensure that the essay remains about your insights and perspective on the text and module. Using supplementary material and critical perspectives in essays, especially during exams, is a skill. Matrix students get detailed explanations of how to do this in the Matrix Theory books. The best way to perfect your use of critical perspectives is to write practice essays incorporating them and seeking feedback on your efforts. Essay Writing Part 4: How to Write A Body Paragraph. Now that we’ve got our body paragraphs down we need to look at how to write introductions and conclusions. Introductions and conclusions are very important because they are the first and last words that your marker read. First impressions and final impressions matter, so it is very important to get them right! So, we need to know what an introduction needs to do. Don’t worry, it may sound like a lot, but it isn’t really. Let’s have a look at some of the practical steps that Year 11 Matrix English students learn in class. Introduce your argument (the thesis). – What do you feel is the correct answer to the question? Present the ideas you feel are relevant to your argument. – What have you studied that supports this position? Explain how you will discuss them. – How will you logically structure your argument? Explain the connection to the module. – How does all of this connect to the module? You already have your thesis – You just need to polish the wording of it. You know what your themes are – You can use your topic sentences to produce your thematic framework. You have discussed the module concerns throughout the essay – You just have to summarise the relevance into one sentence. Essay Writing Part 2: How to Structure Your Essay Introduction. Remember, your conclusion needs to recap your ideas and thesis. You also need to leave a lasting impression on your reader. Conclusion are actually these easiest part of the essay to write. Reassert your argument (the thesis). Recap your supporting ideas and the approach you took to them (thematic framework). Make a final statement about your argument and the module. You should only write your conclusion after you have produced the rest of your essay. Often the hardest part is knowing how to finish the conclusion. The thesis (1.) and thematic framework (2.) need only be reworded from the introduction, but your concluding statement (3.) needs to do something new. The final statement needs to explain the connection of your argument to the module and what YOU have taken away from the study of the module. The first statement tells the marker nothing about what the student has taken learned from the module. The statement it makes only partially relates to the module, and it is not original – many students will write something similar. The second statement gives a personal insight into the student’s experience of reading The Crucible and studying Module A: Narratives that Shaped the World. This second statement is what your markers are looking for! The best way to get good at writing introductions and conclusions is to practice writing them to a variety of questions. You don’t always have to write the whole essay, but you can (it’s the best practice for writing Band 6 essays)! If you are still struggling with how to write your conclusion, take the time to read through our detailed blog post Essay Writing Part 5: How to Write a Conclusion. Now that we’ve looked at the basics of how to write an essay, we need to consider the exam essay. It’s one thing to take your time crafting an essay over a couple of hours or days, but an entirely different experience to write one in under 40 minutes. It’s now time to see what that involves and how it differs from the process above. The most common form of assessment for Stage 6 English is the in-class essay or HSC essay. (You will have to sit at least 6 essays in Year 12!) Let’s have a look at some stratagems for preparing for these assessments. What are markers looking for? It is imperative that you keep these aims in mind at all times when you are writing your essay. Matrix students are taught how to address these criteria in their responses. You must ensure that you demonstrate a skilful ability to answer each of the seven criteria above. It’s tempting to memorise an essay for an exam. Don’t. It’s a risky strategy and assessors are increasingly asking more complex and specific questions to catch out students who try and game the system like this. This is especially true in the HSC, where the questions are becoming more focused and thematically specific to weed out students who engage in this practice. Know Your Texts – Make sure you read your texts multiple times! Know Your Module – Make sure that you are very familiar with the syllabus rubrics and outlines. Organise Your Notes – Make use of tables to organise and sort your notes. Make a Study Rhythm – You know when you have assessments coming up well in advance. Plan out your study timetable long before you receive your notification so that you have already begun studying for your task. Do not wait until two weeks before your exam to begin studying! Make a Study Group – Share your notes with your peers. Take turns quizzing each other on content. Write Lots of Practice Essays – The best way to improve your essay writing skills is to write practice essays to as many different questions as you can. Ask your teacher for practice questions. Matrix Theory Books contain a variety of Module specific practice questions. Get Feedback – Seek out feedback on your essays. Ask your teacher, your parents, and those in your study group. Feedback is a great way to get a second opinion on your work and argument. Write More Practice Essays – There is no such thing as too many practice essays. The more you write and refine your essay writing and structure, the better you will be as an essayist. This is what to do to prepare, but what do you do during the exam? Let’s see. Gameday has arrived. You sit in the classroom and wait for your teacher to say: “You may open your paper!” But what do you do after that? Read the question(s) at least 3 times. You want to be certain about what it is asking you. Sometimes you won’t be able to plan your essay on paper for a few minutes, but you can still do it in your head. Unpack the question and think about what your response to it is. Mentally map out the most relevant themes and best structure. Consider what examples are best suited to supporting your argument. Take the time to plot these things out when they say you can start writing. It is worth the extra few minutes to have a plan on paper to guide your response. Sometimes you will be able to plan before you write. Take advantage of this and do a thorough mind-map. Plot out your themes, structure, and examples. Try to sketch out your topic sentences and thesis. The more you can set down before you are told to start your essay, the more your essay will have detail, structure, and insight. Plan your time! Set a time limit per section and stick to it. You don’t want to have to skip a paragraph or run out of time to finish the conclusion. If you must choose, finish your conclusion over a body paragraph. Write a thesis that answers the question. It’s essential that you present a clear, direct, and concise response to the question. Provide a thorough thematic framework. The more detailed your framing of your argument, the easier it is for your marker to follow your argument and logic. You want to make their job easy. It makes it easier for them to give you marks. Make sure you relate the introduction to the Module. When you write your body paragraphs, always refer back to your mind-map and your introduction. You need to write a sustained argument under pressure. It is easy to get side-tracked and go off on tangents. Referring to your plans will keep you focused and on track. Make sure you signpost! Topic Sentences and Linking Statements guide your marker through your essay. Make sure that you sum up your argument clearly and accurately. If possible read through your essay before writing the conclusion. This way you can ensure that you are writing the best conclusion for your argument! Proof your essay. You want to mop up those little errors that may cost you marks! Familiarise yourself with the module rubric and assessment notification – Your teachers will not set you a question that is completely unexpected. They must draw the ideas and terms of the question from the Stage 6 Preliminary English Module rubrics that we looked at previously in Part 1. Knowing the details of these rubrics will enable you to unpack the question’s module concerns with relative ease and focus on the textual aspects of the question. Know your text – The easiest way to fail an essay is to not know your text well. Make sure that you have studied it in depth and revised all of the themes that you can discern. If you’re unsure, read Textual Analysis – How to Analyse Your English Texts for Evidence. Let’s have a look at an example question for Module A – Narratives that Shaped the World. To what extent do you agree with this statement? Discuss with detailed reference to Arthur Miller’s The Crucible. To answer this question, you will need to address these aspects of the module. It is arguing that humans develop their identity, in part, through storytelling. We develop our understanding of the world through the texts that we read and engage with. We define our cultural and personal identities, in part, through the texts we read and write. We also try to understand and criticise contemporary events by discussing them through the lens of past events and narratives. Once you’ve written an essay, you will need to edit it. In the next post, we’ll have a look at how to proof and edit your work in detail. Are you struggling with essay writing? Practise essay writing with Matrix English Skills Course during the school holidays. Learn how to structure and write an essay step-by-step with HSC experts. Learn more about Year 11 English Skills Course.